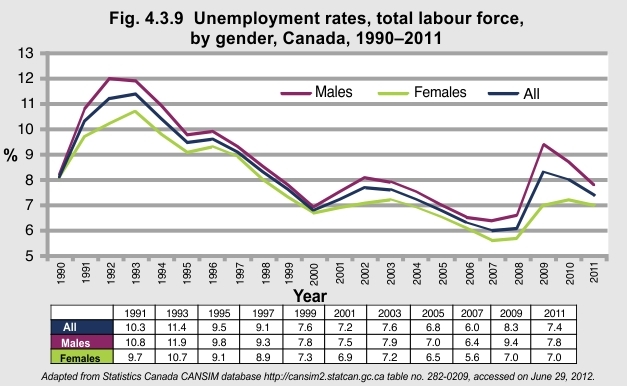 The unemployment rate is the percent of people who are unemployed of all people 15 and over who are in the labour force (working and seeking employment).1During the recession in the early 1990s, unemployment in Canada rose to 11.4% for the total labour force. The economic boom in the late 1990s brought unemployment down to 7.6%. After a small increase, 2007 saw the lowest unemployment rate since 1991 at 6.0%. However, a further economic downturn in 2009 caused another peak in unemployment. As of 2011, the unemployment rate has declined to below 8%. In all years, unemployment among males was higher than for females. 1Statistics Canada CANSIM database http://cansim2.statcan.gc.ca table no. 282-0209, accessed on June, 29 2012. Labour force includes both those who are unemployed and those who are searching for work.